Leopard Sharks are easily one of the neatest species I’ve caught. I’d love to catch a big one. Photo courtesy California Department of Fish and Wildlife. This is the fourth story in succession and ties in with the other species I caught on the same day, and you’re best reading them in order: First and Second and Third. It was so long ago; the memory is fuzzy. The experience was certain, but some details are blurred at the bloodshot, tired edge of reality. Whether it happened this way exactly while the little boy watched, or a fantastical young mind crafted sensory elements to accompany a particularly gripping story is uncertain. There was a little boy with his family. He might have been three or seven or 10, but he certainly wasn’t any older. He watched a man in overalls fishing from the beach. Grandpa wore overalls. This guy was wearing overalls, but they were rubber. Or plastic. Like the memory of that day. Anyway, the man was using an absolutely gigantic fishing pole. Dad didn’t know why. Neither did Mom. That frustrated the boy. He liked to know why. So as the family passed, the boy asked. The old fisherman told the boy it was to keep the line above the breakers, another name for waves, apparently. “What are you fishing for?” the boy asked. The boy wondered aloud if perch could go in the ocean. He’d caught perch before. These were different perch, though. Different perch and breakers. The boy was learning. The man’s rod doubled, and he caught a silverly fish he called a surfperch right then. The boy ran up to get a better look, his parents cautioning him to not get in the man’s way. The man didn’t mind. He proudly showed off his catch before putting it in a bucket. The young family grew tired of watching, so they started on down the beach. But the boy kept looking back. He couldn’t focus on the sand dollars or shells or the wet gooey sand between his toes. He was fascinated by the man behind him fishing. Before the family left for the day, the rod doubled again, but no silvery surfperch broke the surface. This fish was clearly bigger. It ran and dove, and after a few minutes, the boy had frozen, intently watching the action. What emerged from the water was shocking. It looked like a shark, but it had spots and looked more like a jaguar or a leopard. As the boy would find out, it was both. Catching a Leopard Shark became a life goal that day, and though the story’s details blurred, the beautiful fish never did. 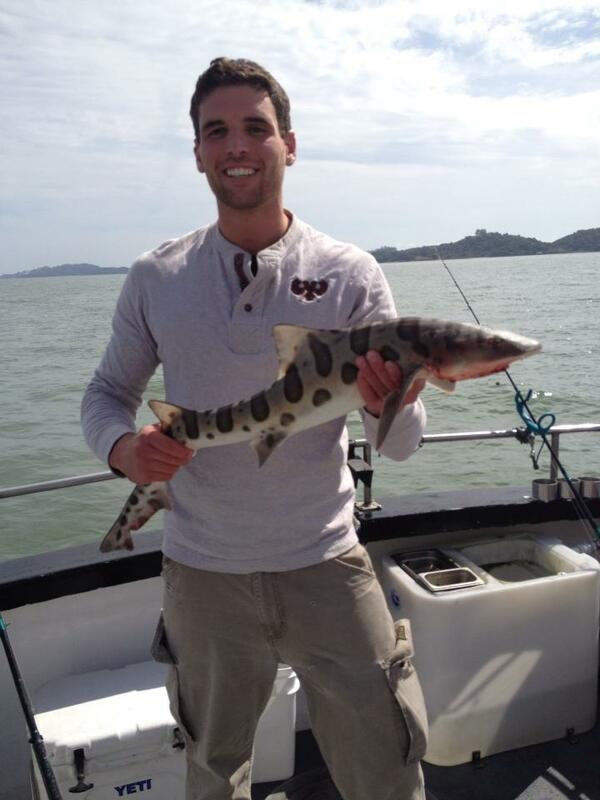 The boy, now a man, tried chasing Leopard Sharks during college, but failed the first time. On the second pass, he found more success. His party had already boated two other species of sharks, rays, and his friend Ben even boated a Striped Bass. Though Leopard Sharks were always a reasonable possibility along the California Coast, the man just didn’t expect it to happen. So, when line began ripping off the baitcaster again, he assumed it was something else. When the color flashed in the creamy aqua water, the magical moment on the beach all those years before came back to him. He’d finally done it. The little boy’s dream had become a reality all these years later. The captain began talking about how these beautiful sharks tasted like salmon, so the man was excited to try them. Unfortunately, this fish measured 35 inches in length, and Leopard Sharks have a minimum length of 36 inches in California. Still, after a few quick pictures and a release, the man still felt privileged to have captured such a gorgeous fish. My first Leopard Shark was just an inch too short to keep, but it was still a great fight on relatively light tackle. Read the next entry in #SpeciesQuest here: Species #47 — Striped Bass.